A paddling tour of the southern Adirondacks. 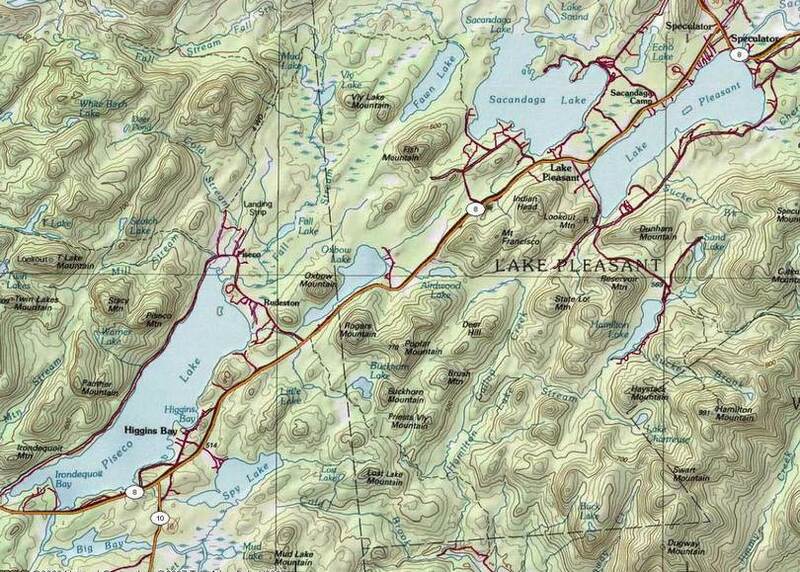 This is not a pure wilderness route, as most of it is a front country tour of Piseco Lake, Sacandaga Lake and Lake Pleasant. At the same time, there is plenty of wilderness paddling required to connect the three big lakes. It so happens the position of Piseco, Sacandaga and Lake Pleasant in the southern Adirondacks can be linked together with several streams, smaller lakes and two canoe carries, to make a multi-day, 30 mile canoe route. After a rendezvous at Speculator we put-in at Piseco Outlet (a.k.a. Big Bay) along Route 10 on Friday morning, after leaving a vehicle at Duck Bay on the Sacandaga River off Rte. 30, south of Speculator. We put in and began paddling at 10am. With unusually low water levels we had to line the canoe through the rocky elbow of Big Bay. Calm conditions allowed us to easily paddle across 5-mile length of Piseco Lake past three state campgrounds. From Piseco Lake we entered Fall Stream and headed to Vly Lake. Fall Stream is passable by small watercraft from the Old Piseco Road to Vly Lake and is used for canoeing, fishing, hunting, and trapping; in addition to providing access to Fall Lake and Vly Lake. The meandering narrow stream bed winds across a broad, marshy area with the terrain consisting of low rolling hills, traversing through a picturesque marsh for most of the trip with occasional beaver dams to carry over. Apart from a two docks just past the put-in, Fall Stream is undeveloped. We portaged around the short section of rapids (about 50-60 feet long) under the bridge and took a break for lunch at the put-in. We watched 3 kayakers and one tandem blue canoe launch and head upstream in advance of us. We also saw a small pickup truck in the parking lot that probably held a car top fishing boat. We paddled up Fall Stream passing over two large beaver dams to Vly Lake. A large dead fall had been recently cleared with a chainsaw so it posed no obstacle. We met up with the three kayakers at the 2nd large beaver dam and stopped to chat with two fisherman exiting Fall Stream in their fishing boat. They reported catching several pickerel on their fishing trip. They had a chain saw and had been responsible for clearing out the dead-fall. A two primitive tent sites are located on Vly Lake which is a beautiful, isolated spot. The lake is surrounded by mountains with Vly Lake Mountain right on the eastern shore. We reached our campsite on Vly Lake at 2:30pm. Above Vly Lake, Fall Stream becomes narrower and the number of obstacles increase. The last time I had visited the Vly Lake campsites the western most campsite had been “improved”. It had a an old canvas chair, a gas barbecue grill sans the gas tank, two flag poles, a half buried 5 gallon bucket (clean and 1/3 full of water), and a lot of garbage. The last residents had left a smoldering fire and left toilet flowers all over the woods. They had cut a large spruce tree off at 4′ that was apparently obscuring their view and dropped it into the lake. They dumped crackers on the ground, burned their cans in the fire and dumped beans on the ground. We ended up taking 2 bags of trash out with us on Saturday. On this trip the campsite was clean. We hung out for the rest of the afternoon watching water fowl and beaver, ate an early dinner and turned in for a great night’s sleep shortly after dark. Saturday morning we began the 1¾- mile carry over a shoulder of Vly Lake Mountain on a trail that has been maintained by canoe parties from Camp Fowler kid’s camp out of Speculator. There is no official trail to Fawn Lake. The trail was marked in a few sections by yellow and orange flagging tape and in others with occasional old, faint tree blazes and lopped off branches providing clues. The inlet to Fawn Lake is a beaver damned, blow-down clogged inlet stream on the south side of the lake. More flagging tape leads another .25m the lake shore to a shore side campsite and launch point. Fawn Lake is an undeveloped lake surrounded on all sides by the Jessup River Wild Forest. Fawn Lake is as popular for its sandy beach and easily accessed back country campsites as it is for fishing. Fourteen undesignated tent sites currently exist at Fawn Lake. Wild brook trout can be caught from shore in the spring near deep water areas. Small mouth bass and pickerel are also found here in lesser numbers. According to the DEC UMP two deer wintering areas have been identified on the northern and eastern shore of Fawn Lake. 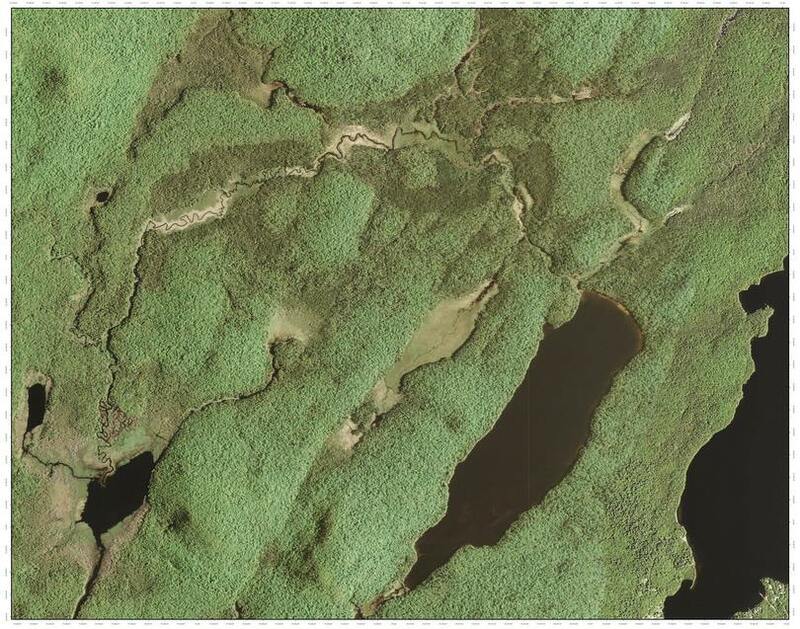 Below are Mud Pond, Vly Lake, Fawn Lake and the western shore of Sacandaga Reservoir. Upon reaching Fawn Lake at 1pm we decided to proceed to Sacandaga Lake and make a determination based on the wind and weather to proceed or camp for the night. As we launched the rain showers began. We donned rain gear and paddled across Fawn Lake. At the northern end of Fawn Lake there is a long sandy beach. We disembarked and did the ½-mile carry to Indian Bay on Sacandaga Lake. It was 2:30 when we reached the shores of Sacandaga Lake. We observed a dead calm lake under heavily overcast skies. Since it was still early in the afternoon and we had unusually calm conditions we made the decision to return to the car in Kunjamuk Bay. Ten minutes after launch we found ourselves in a down pour trying to decide whether to pull ashore and wait out the storm or to continue paddling. I was concerned that we would be fighting hypothermia by standing around in wet clothes and so I was glad to continue paddling. We paddled the breadth of Sacandaga Lake with light crosswinds; then paddled the outlet stream under Rte. 8 to Lake Pleasant. We paddled down Lake Pleasant to its outlet, where we paused to exit the canoe and stretch our legs. This brief five minute stopped chilled us so we hopped back in the boat and continued another 30 minutes down the flatwater Sacandaga River through Kunjamunk Bay to Duck Bay and our vehicle.